Released 1988 on Refuge Records. 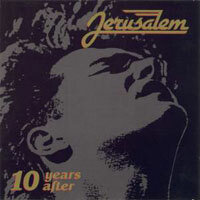 This is a compilation album including songs from Jerusalem’s first 10 years, from the albums “Volume 1″, “Volume 2″, “Warrior”, “Can´t stop us now”, “Live in USA – In His Majesty´s service”, “Dancing on-the head of the serpent” and from Ulf’s soloalbum “In My Dreams”. The song “Covered By Blood” is found on some versions.